Sound provides a lively and engaging overview of relevant critical theory for students and researchers in theatre and performance studies. Addressing sound across history and through progressive developments in relevant technologies, the volume opens up the study of theatrical production and live performance to understand conceptual and pragmatic concerns about the sonic. By way of developed case studies (including Aristophanes's The Frogs, Shakespeare's The Tempest, Cocteau's The Human Voice, and Rimini Protokoll's Situation Rooms), readers can explore new methodologies and approaches for their own work on sound as a performance component. In an engagement with the burgeoning interdisciplinary field of sound studies, this book samples exciting new thinking relevant to theatre and performance studies. 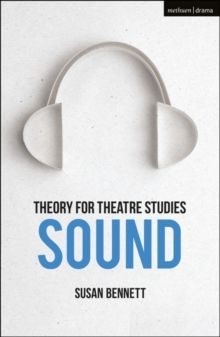 Part of the Theory for Theatre Studies series which introduces core theoretical concepts that underpin the discipline, Sound provides a balance of essential background information and new scholarship, and is grounded in detailed examples that illuminate and equip readers for their own sonic explorations. Volumes follow a consistent three-part structure: a historical overview of how the term has been understood within the discipline; more recent developments illustrated by substantive case studies; and emergent trends and interdisciplinary connections. Volumes are supported by further online resources including chapter overviews, illustrative material and guiding questions.